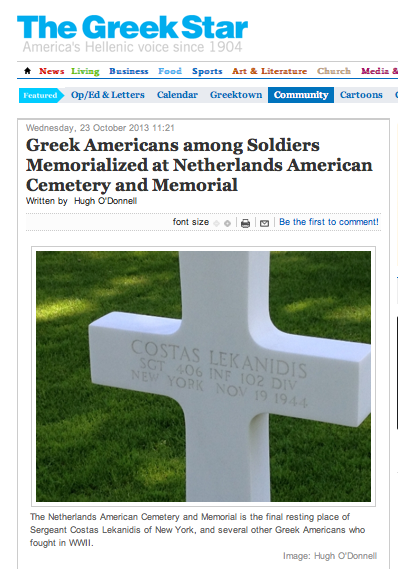 On October 10, 2013 the article "Greek Americans Among Soldiers Memorialized at Netherlands American Cemetery and Memorial" by Hugh O'Donnell was published in The Greek Star. The Netherlands American Cemetery and Memorial, in Valkenburg, is the final resting place of Sergeant Costas Lekanidis of New York, and several other Greek Americans who fought in World War II. The Greek Star would not give me permission to reprint the article here on the Hellenic Genealogy Geek Blog. If you are interested in reading the entire article you will have to sign up for The Greek Star.